Looking for a Gift Card Voucher? Give the Gift of Skid Pan, Drift, Race, Track, Rally, Motorkhana and More! This year we head back to QR Short Track for our exclusive half day drift day! Spots are limited for MAXIMUM seat time, no waiting forever to get on track or sharing the track with loads of cars if you don’t want to! This is the only drift event with free professional tuition, or just jump in your car with mates and drift for fun. Tandems, trains, no noise limits, just a good day with the boys and girls shredding some tyres! The cost is $125 per car and extra drivers are $60 – payment secures your spot. There are only 15 cars per drift session so get in early to book your spot! The event runs from 08:30 – 12:30, be at the gates at 08:00 sharp! That’s 4 hours of drifting for $125 and only 15 cars, suitable for drivers of all levels! Our venue allows you to run multiple layouts in every run you do, by yourself or in a tandem! The track is so wide that you can run nice and tight if you’re a beginner and to keep your car safe, or for those who have more experience, you can run the concrete walls nice and wide with some seriously big entries! We will have an instructor available here all day to help you learn if you need it! Closed shoes and seat belts to be worn by all participants, arms to be kept within the vehicle at all times. Please make sure your car is in a respectable condition with secure seats and seat belts. Helmets are required to be worn by all drivers and passengers. Fire Extinguishers are highly recommended! No drifting on the rim of the wheels, if it pops you stop and drive back to the pits slowly. No standstill burnouts, this is a drift day not a burnout competition. No loud music or general hooning off the track. Anyone caught messing around outside of the dedicated drift areas will be removed from the venue immediately, no exceptions! Please be advised that although we have an awesome venue with toilets, no food or drinks are available for sale if the canteen is closed, so please ensure you bring food and drinks with you in case. Right of admission reserved – All staff reserve the right to remove anyone who does not abide by these rules, and any rules as stipulated on the day, without a refund. The event runs from 13:00 – 17:00, be at the gates at 12:00 sharp! 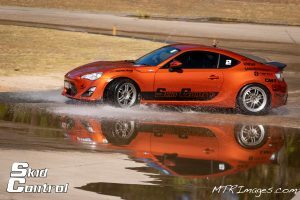 That’s 4 hours of drifting for $125 and only 15 cars, suitable for drivers of all levels! After a lot of searching, we have decided on Lakeside DTC as our next Khanacross venue and we are running this on a Public Holiday Monday! The venue is a gem with a concrete and bitumen short course, it is a driver’s dream to go as fast as possible in predetermined course layouts against the clock, we may even mix it up with some water thrown in on the roundabout! This is one of our cheapest events and suitable for all cars, drivers and loads of fun! Drivers as young as 14 are welcome and any drivers under 16 require a licensed passenger. The cost is $125 per car/driver – payment secures your spot. There are 40 cars per day so get in early to book your spot as they won’t last long! The day runs from 09:00 – 16:00 with a 30 minute lunch break, be at the gates at 08:00 sharp! That’s over 6 hours of Khanacross for $125, unbeatable value and fun! This track is a larger, higher speed Khanacross Course which will change layout half way through the day. The track has awesome challenges set out and will bring a big smile to your face! Minimum age of 14 years to drive, licensed passenger required for anyone under 16 years. Limited to 2 spectators per car, only 40 cars per day. All Cars Welcome, No rego required. Will need to be in a safe, leak-free condition and all working seatbelts & seats. Closed shoes and seat belts to be worn by all participants, arms to be kept within the vehicle at all times. Please make sure your car is in a respectable condition with secure seats and seat belts. Helmets are required to be worn by all drivers and passengers . Fire Extinguishers are highly recommended! Drifting is not allowed but sliding to navigate the course quicker is acceptable. No standstill burnouts or excessive sliding. No loud music or general hooning off the track. Anyone caught messing around outside of the dedicated track areas will be removed from the venue immediately, no exceptions! Please be advised that although we have an awesome venue with seats and toilets, we can’t guarantee the Canteen will be open, so please ensure you bring food and drinks with you. The cool weather has arrived, and we have another full Day Skid Pan for you to enjoy! $155 for the morning or afternoon or $290 for a full day and more track time than you can handle! car hire is also available at $220 for half day or $420 for a full day, just arrive and drive as everything is covered for you! Use the coupon code “fulldaymay2019” at checkout to get your discount for full day bookings! The cost to bring your own car is $155 or you can make use of one of our official Skid Control vehicles for $220. It runs from 08:30 – 12:30, be at the gates at 08:00 sharp! The venue is a wet diesel skid pan which is low wear and tear on tyres & vehicles. All registered vehicles are welcome, this includes all drive types from FWD, RWD to AWD. The event will run for 4 hours and is limited to 13 drivers. Please be advised that although we have an awesome club house with seats and toilets, no food or drinks are available for sale (other that our complimentary coffee, tea and water), so please ensure you bring food and drink with you. It runs from 12:30 – 16:30, be at the gates at 12:00 sharp! 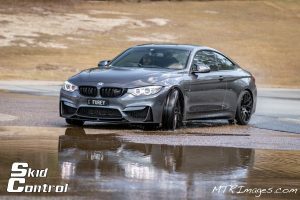 Saturday Afternoon Skid Pan, perfect time to let you sleep in, slide your car for the afternoon and still go out that night! Come enjoy the perfect Autumn Saturday Afternoon with us! An Autumn Sunday morning at the Skid Pan to finish off the weekend right. This is great alternative to a Sunday cruise where you can enjoy your car fully without attracting the attention of the cops. 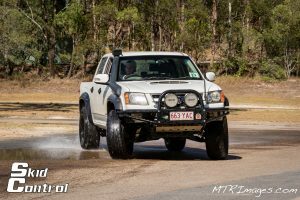 Our Skid Pan, Driving Skills, Drift, Track, Race and Rally events are run on various days throughout the year and their dates and times can be seen in the calendar. Select the date you want to attend, click on the green ticket button, choose your vehicle option and proceed to checkout. Payment options include PayPal, Credit Card, ZipPay or Bank Transfer. Limited spaces available on all events. Private, Group or School Hire? Are you looking to hire out the Skid Pan, Driving Skills, Drift, Track, Race or Rally Track for a private, corporate or school function? Reduced rates available for private bookings.